Sierra Leone, Freetown, October 2011.\n\nEight months ago, Daniel Bangura, 29, was working as a tailor and living with his wife and infant son in Kambia, Sierra Leone. His wife went away to visit her parents, and when she returned, someone told her that he had been unfaithful while she was gone. “She went to the shop and bought some caustic soda, which she mixed with water,” Daniel explains. “I was sitting down at the table, and she called my name. When I turned to her, she threw the mixture in my face.”\nDaniel spent three weeks in a local hospital after the attack, but his condition only worsened. 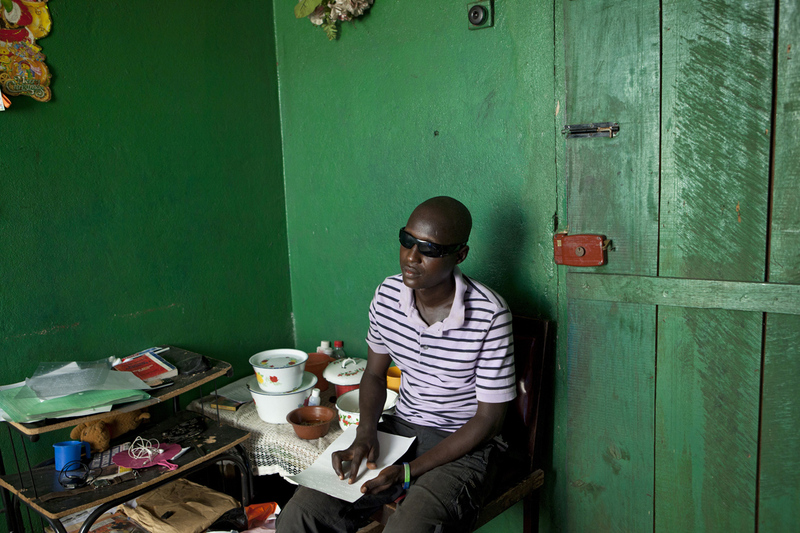 When he heard that Mercy Ships was having a screening, he and his brother came to the Africa Mercy hoping to have his sight restored, but it was too late—his eyes had to be excised to prevent the infection spreading to his brain. \nDaniel’s wife is now in prison, and he lives with his siblings in Freetown, where he is attending school for the blind with the support of a sponsor from Mercy Ships.